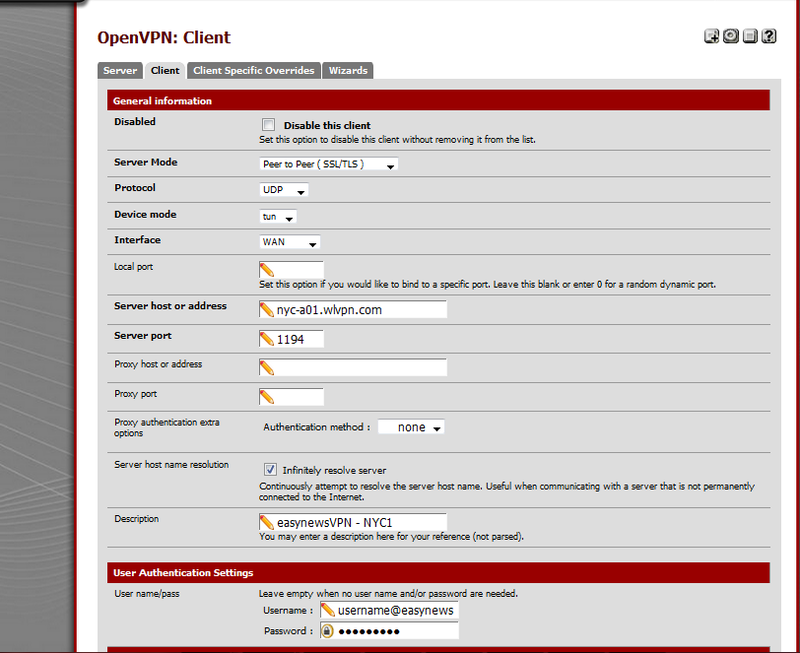 With the little help of the internet, a little trial and error, and previous knowledge, I was able to get pfSense setup to use the VPN service provided by EasyNews. This was done for the following reasons. 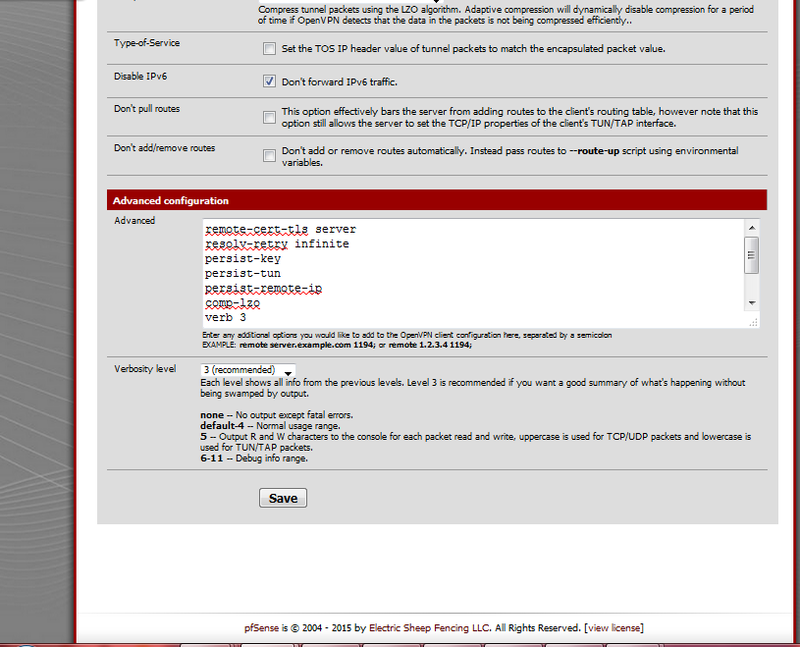 Please note that these directions were originally built for pfSense 2.2.5-6, but then finished on pfSense 2.3.1. While the directions are almost the same, did not see the need or had the time to redo the pictures that were in the 2.2.x format. I changed the tls-cypher because when opening connection, the logs said that DHE-RSA-AES256-SHA was depreciated and TLS-DHE-RSA-WITH-AES-256-CBC-SHA should be used. Click on the OPT1 interface to edit it. Change from "Automatic outbound NAT rule generation. (IPsec passthrough included)" to "Manual Outbound NAT rule generation. (AON - Advanced Outbound NAT)"
Having said that, I work with servers, so my main system is Windows 2012. Now on first look Windows 2012 looks a lot like Windows 8, so why cannot my Windows 2012 system also be my Windows 8 system. Now I don't want a completely transformed OS, but try to get the best of both worlds. So here are the things that I did to my system and hopefully guide you on your transformation. And for why I did this, I can say only 1 thing: I want to play Halo: Spartan Strike on my computer along with my phone. This is a straight forward process, just adding a feature called 'Desktop Experience' If you need directions on how to add this web site has it. Please remember in order you use the Windows App store, you need a Microsoft account, and your logon account cannot be administrator. The script is straight forward and comes with 6 files. Now I normally don't trust these files especially since they are not signed, and I didn't want to expose my system to any unscrupulous files, so I built a Virtual Windows 8, and extracted the same files to install into my 2012 system. I did compare my files to the downloaded files, and they were same on the binary level, but better safe than sorry. Once those files were added the program worked fine, and I am hoping that all other DirectX games will also behave as well. Now the program is running but for some reason, the mouse works, but the keyboard does not. For me fixing that is a simple solution. My system has PS/2 keyboard and mouse, so I just add my USB wireless Logitech K400 keyboard, now the game works!!! I have a working game, but using the keyboard is a little kludgey because the key choices are chosen and you cannot change them, also with the AWSD to move, it is a little choppy. So I picked up a used Rock Candy controller. It plugged in fine, but didn't work. Went to the vendor's web site, pdp.com and they state the controller is for Xbox 360, so there are no drivers for windows. Well not being discourage, went looking for a driver for a Microsoft Xbox 360 drivers from Microsoft and found them here. Installed the driver, rebooted, and the controller worked fine. It plays like a dream and now I can spend all of my time killing the Covenant!! I hope my work will enable you to play this game with Windows 2012, and your system primed to play other games from Windows Store. Virtual Windows 8 ... Sort of. Next just install the OS as normal, it should work fine, no BSOD. Now what I have not seen is anything on VMware tools, and from what it looks like any version of the VMware tools that come with 4.1 will corrupt the video and make it unusable, so when installing VMware tools, use the OSP version. If you want read more about OSP tools, this page is useful. Good luck with your Window 8 / 2012 builds!! This is a modified procedure to use a local file instead of the blacklist from urlblacklist.com. This is a modified procedure for Squidguard. It should be able to go to the website directly and download then update. Update 2014.01.13: added the ability to publish to twitter using twitterfeed. So I concluded to accept the file and not research further.